Srinagar, Mar 25 (KNS): National Conference Vice President and former Jammu and Kashmir Chief Minister Omar Abdullah on Monday sought clarifications from PDP President and former Jammu and Kashmir Chief Minister Mehbooba Mufti on fake permanent resident certificate (PRC), which was exposed by NC leader and a former PDP minister Basharat Bukhari, raids by NIA against separatists, implementation of Goods and Services Tax (GST) and execution of Mufti Mohammad Sayeed Food Entitlement Scheme (MMSFES). 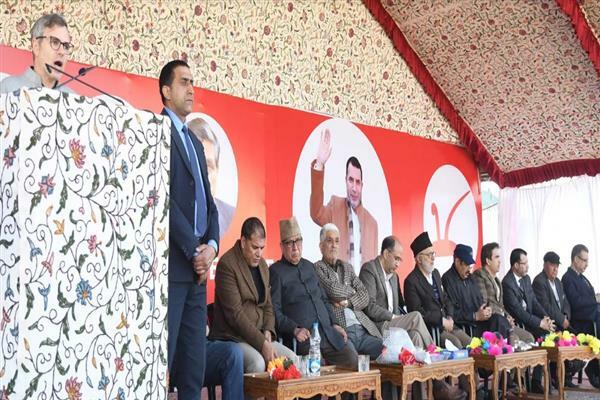 As per Kashmir News Service (KNS) correspondent, addressing an election rally in North Kashmir’s Baramulla district, Omar hit out at PDP President and another former Jammu and Kashmir Chief Minister and sought from her clarifications over fake Permanent Resident certificate recently (PRC) scam unraveled by a National Conference leader and former Revenue Minister Basharat Bukhari. Omar asked if Mehbooba could not initiate action on fake PRC Sam then how come she would defend Article 370 and Article 35A.? Omar said "Mehbooba can't reply these questions", adding tbat she bulldozed special status of the State by implementing the central food supplies scheme code named Mufti Mohammad Food Entitlement Scheme (MMSFES), and Goods and Services Tax which have choked the economy of poor people. “Sajjad Lone also sent the letter. Who were supporting him? He (Lone) had support of all the BJP MLAs. So it is very clear that voting Sajjad Lone will be voting for Modi. Who will here support BJP and Modi who are adamant to erode Article 370,” he said. Omar said that the BJP has a clear policy to revoke Article 35-A, and destroy the special status and identity of Jammu and Kashmir. “Will you people support these BJP backed people?” Omar told the gathering. Omar asked people to vote for the parliament member who will fight for the special status of J&K in parliament, for your rights, for your identity and for your development. Omar went on saying that in north Kashmir, he sees only one candidate in the field and the candidate is the one who even at times makes “my blood pressure high”, and that candidate is Akbar Lone.